There is nothing more frustrating than a blocked drain. It puts a stop to your whole plumbing system in the house or business, as the water has no-where to escape. If the worst comes to the worst and you discover that you have a blocked up drain, depending on how bad the blockage is, you may be able to tackle the problem yourself and save on the delay and expense of a professional call-out. This guide will help you determine if it’s a problem that you can solve without calling a plumber. Lift the drain cover nearest the house to see if the chamber is blocked and full of water. You may need to use an implement such as a spade or crowbar to help you lift the drain cover. If the chamber is clear, the blockage is somewhere in the soil pipe from the house to the chamber. If there’s water in the chamber the problem lies further along the pipe work, which is closer to the main sewer. Check the next chamber and so on, until you have isolated the blocked problem area. Having identified where the problem area is located, you then need to purchase a set of drain rods with screw and plunger ends that are available from most DIY and plumber merchants stores such as Bunnings. Screw together two of the drain rods with the plunger head and push the end into the opening towards the blocked area. To help the rods get through the pipe, rotate them slowly clockwise. Don’t turn the rods anti-clockwise, as this will cause them to unscrew and come apart in the drain. Having cleared the debris, run a hot tap in the house to try and clean out any remaining obstructions in the drain. Hopefully now your drain will be running well, but if having tried the above you are still having problems, you will need to call in a professional. 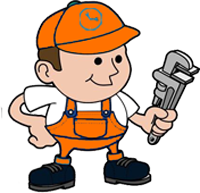 If you are having further issues, get in touch with a great plumber from Melbourne 24 Hour Plumbing.